Flawlessly simulate natural and synthetic lights with the legendary Sapphire Lighting Unit. Glow - Generate natural, organic light from the brighter areas of your video. GlowDarks - Areas of the source clip darker than the given threshold are blurred and combined with the input clip to give a deep smoky look. ZGlow - Glows areas of the source clip with varying widths depending on the depth values from a ZBuffer input. EdgeRays - Generate glorious high-quality beams of light that emit from the edges of objects within your video footage. LensFlare - Generate photorealistic and stylized lens flares or build your own custom flare. LightLeak - Render sheer, abstract patterns of color that simulate light leaking through gaps in a camera body. Flashbulbs - Simulates lots of flashbulbs going off. With many small flashes, can look like a stadium scene. With a few large flashes, works well on a celebrity red carpet clip. Rays - Generate high-quality beams of light that emit from the brightest parts of your footage. Glare- Composite halos and glint rays to your video by detecting the brightest areas of the frame. 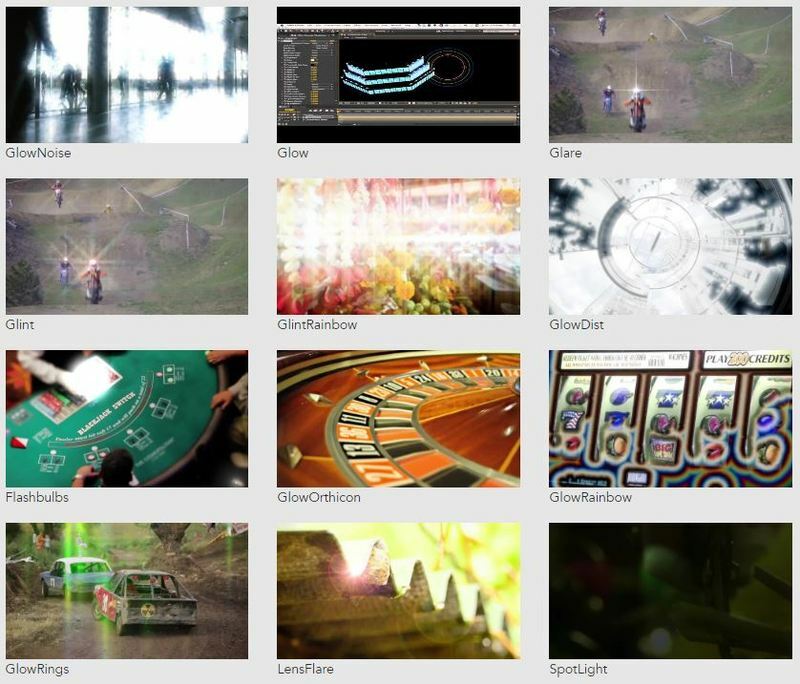 Glint - Generate star-shaped glimmers in brighter areas of your video. EmbossDistort - Emboss or concave your video by using a custom relief map. Create large bold bumpy distortions or thin glassy indentations. EmbossGlass - Emboss or concave your video using a custom relief map while adding a vibrant chroma distortion. EmbossShiny - Emboss or concave your video using a custom relief map while adding lighting effects to bring out highlights, reflections, and shadows. SpotLight - Highlight a specific area of your footage with a range of harsh and soft spotlights.